Tag line: "Small town delinquents. Shady cops. Pretty good girls. And very, very, bad boys"
It starts innocently enough: Lehiff (Colin Farrell) is in a small café situated smack-dab in the middle of a busy shopping center. He’s chatting to the pretty waitress (Kerry Condon) that works there, and based on their conversation, we get the distinct feeling that Lehiff fancies her. “Who knows where the sparks will lead?” he says to her, “And a fella like myself, a stranger, could just be a bit of fun in the sack, no more than that. Or… and it's not that crazy… your soul mate”. The waitress smiles; clearly, she’s as smitten with Lehiff as he seems to be with her. But this exchange is not what it appears to be. Moments later, something quite unexpected happens, and things quickly spiral out of control. With that, Intermission, a flashy, stylish film by first-time director John Crowley, is off and running. Lehiff is but one of this crime / comedy’s many characters. We also meet John (Cillian Murphy), a clerk at the local grocery store who recently broke up with his longtime girlfriend Diedre (Kelly MacDonald). John felt they needed a break from each other, but after talking things over with his co-worker and best pal Oscar (David Wilmot), a guy who hasn’t had a date in months, John thinks he may have made a mistake. But it’s too late; Diedre has already hooked up with Sam (Michael McElhatton), a bank manager considerably older than she is. Sam is so in love with Diedre, in fact, that he’s left Noeleen (Diedre O’Kane), his wife of 16 years, to move in with her. Diedre’s sister, Sally (Shirley Henderson), is still reeling from a disastrous relationship of her own, and is none too pleased that Diedre is committing “adultery” with a married man. And then there’s Mick (Brian F. O’Byrne), a bus driver whose recent accident has cost him his job. Mick told his superiors what happened; that he lost control of the bus when an adolescent punk (Taylor Molloy) threw a rock through the windshield. Alas, nobody believes him. Fortunately, not everyone in this Dublin neighborhood is having a bad day. Jerry Lynch (Colm Meaney), a gung-ho police inspector, has been approached by TV producer Ben (Tomás Ó Súilleabháin), who wants to make a hard-hitting documentary about the fight against crime, with Jerry as its star. The egotistical Jerry, whose no-nonsense attitude has pissed off a few small-time thugs (Lehiff included), is only too happy to oblige. In addition, Diedre’s mom, Maura (Ger Ryan), is now a local celebrity, praised by the media for her role in rescuing people from the wreckage of an overturned bus (the very crash that put poor Mick on the unemployment line). Over the course of several days, the lives of all these individuals will intersect, culminating in an attempted robbery that’s sure to land a few of them in hot water! With so many characters, you’d think the movie might get a bit confusing after a while. 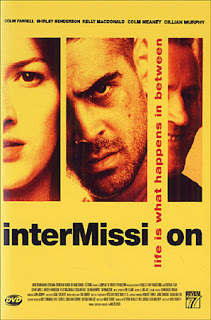 But thanks to Mark O’Rowe’s smart, profanity-laced script and the excellent performances of its cast, Intermission is anything but muddled. On the contrary: the characters are so well-realized that every single one of the film’s subplots or individual tales, regardless of how much or how little time is dedicated to them, is thoroughly engaging. Add to this director John Crowley’s cinema-verite approach (there’s plenty of handheld camerawork), some very explosive scenes, and heaps of witty dialogue, and you have a movie brimming with energy. Yet what’s truly amazing is that, through all of the craziness that plays out on-screen, all the swearing and the sudden violence that hits us from out of the blue, Intermission is, at its heart, a love story (or should I say stories), with men and women looking for that special someone (and occasionally finding them). That, in my opinion, is the most endearing aspect of this underrated 2003 gem.